easy-to-use photo editor and graphics design. 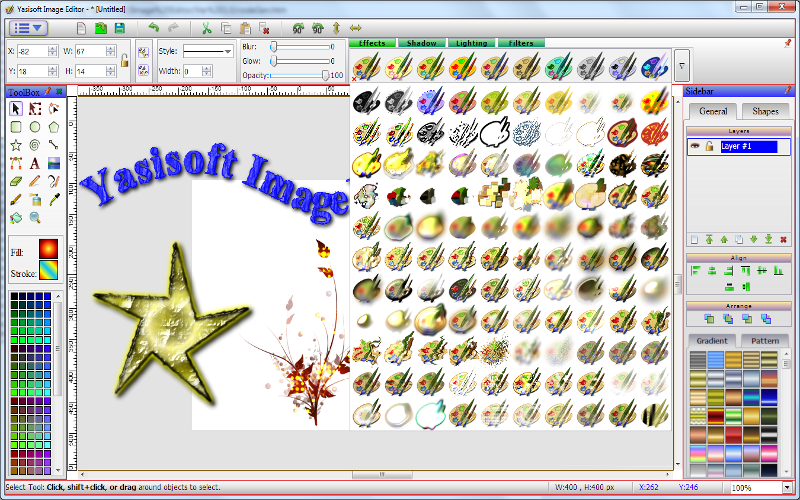 Working with Yasisoft Image Editor is very simple. All tools and effects are easy to understand and to use. Features and Capabilities: Draw basic shapes (such as Lines, Curves, ellipses, rectangles, stars, polygons and spirals) as well as the ability to transform and manipulate these basic shapes by rotation, stretching and skewing. Layers: Layers allow an image to be composed from a stack of images that are blended together. Support for many popular file formats: PNG, JPEG, BMP, GIF, TGA, WEBP, TIFF, SVG, RAW camera images and many others. Many Bitmap special effects are included for enhancing and perfecting your images. Everything from blurring, sharpening, brightness, contrast, hue, saturation, distortion, noise, and embossing are included. You can also convert an image to black and white, or sepia-toned.